The Faithfull FAIVMULTI360 is a truly versatile multi vice, which is ideal for use by both mechanics and engineers. The body and sliding jaw are constructed from fine grey cast iron and are machined to provide a smooth and reliable clamping action. The jaws, handle and main screw assembly are made from hardened steel. 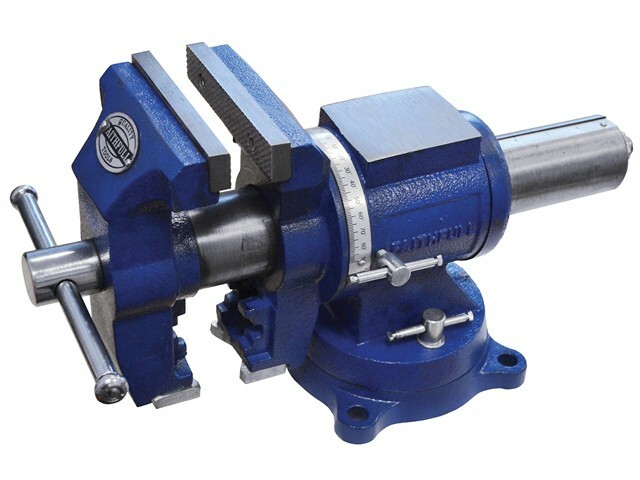 This strong durable vice offers many features including a four point bench mounting 360° swivel base and an ingenious rotating jaw head that allows the selection of either a standard parallel serrated jaw, or pipe jaws with an integral V-jaw assembly depending on the work in hand. The jaw head can be pivoted 180° either side of vertical and locked in position, meaning it is able to provide the perfect working angle for any application. To avoid over-loading, the vice is fitted with a fused steel main handle. Anvil size: 80 x 65mm.